Kicking Horse Mountain Resort currently offers nearly 3,000 acres of awesome BC terrain and boasts a huge historic annual snowfall of 25 feet a year - making it the envy of many a neighbouring resort. Kicking Horse is now firmly established as a popular ski holiday destination for Ski Independence guests whether as part of a longer Canadian Rockies road-trip itinerary or as a stand-alone resort in its own right. Kicking Horse is definitely a skiers resort with the upper mountain unashamedly stacked with countless black and an unprecedented 60 double black diamond runs. You’ll find four massive alpine bowls and four ridges featuring over 85 inbound chutes. You get a sense of what the resort is focussed on by checking out some of the great trail names: Terminator, Unnecessary Roughness, Valhalla, Consequence and Prairie Oyster. The resort infrastructure is outstanding, there's a good choice of ski hotels and condos in the village plus a modern, efficient lift system accessing the mountain. Kicking Horse should be on your list! As with most top Canadian ski resorts, novices and learners are well catered for mostly at the base of the mountain. Once they’re feeling confident learner skiers can ascend from the resort base to the summit of the mountain courtesy of the Golden Eagle Express gondola. After a quick selfie, something to eat or drink at the mountain-top Eagle Eye restaurant, and a peek at the stunning 360 degree panoramic views of the Rockies, they can gently cruise down the meandering easiest way down all the way home – a great way to end the day! Intermediate skiers and riders are similarly well taken care of with lots of choice all over the mountain – a favourite run is to ski laps on the Stairway to Heaven lift to the 8033ft summit down Cloud Nine trail, and repeat! Meanwhile advanced and expert skiers and riders are really spoilt for choice here – the upper mountain at Kicking Horse used to be heli-ski terrain, and it still retains that wild, airy and edgy feel. Make no mistake, this is proper full-on technical and steep terrain where you’ll find chutes, trees and drops - certainly not for the faint-hearted, but if you have the skills to pay the bills, this is the place to be. A stop for lunch at the impressive mountain top Eagle's Eye restaurant – Canada’s most elevated dining experience - a must for those who wish to rest weary limbs, replenish energy reserves and admire the stunning views. At the end of your epic ski day, cruise down the monstrous 4133ft vertical and finish by sipping a cool Kokanee at the Whitetooth Grill – renowned for great food, special après-ski drinks specials and live music most weekends. All of our featured accommodation is located at the Kicking Horse resort base, either ski-in/ski-out or slopeside, but the town of Golden is only a short 15 minute away. 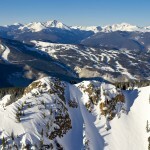 Ski Independence can also offer day trips to Revelstoke from Kicking Horse. Revelstoke is North America's newest resort with the longest lift serviced descent at 5,620 vertical feet. All of our holidays to Kicking Horse include the flexibility of self-drive car rental from Calgary. We offer 'Gold' option car rental which includes all the mandatory taxes & fees, extra drive fees, fuel and ski rack. We can also offer vehicles with SatNav.